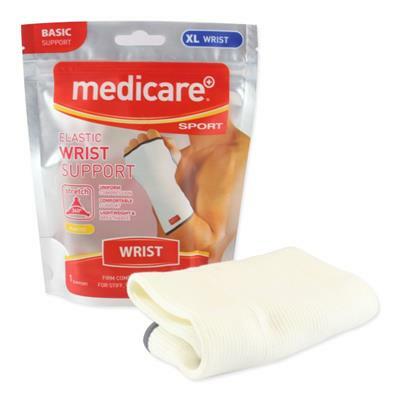 The Medicare Sport Elastic Wrist and Thumb Support is a simple and effective support that stabilises the wrist and thumb together. It provides support for weak or overworked wrist and thumb joints. The Support is suitable for light compression. It has a versatile, 360 degree stretch, breathable fabric and contouring design for a more comfortable fit. By minimising movement and offering additional support, the Elastic Wrist and Thumb Support works to aid rehabilitation for the wearer. Common conditions that require thumb and wrists supports include repetitive strain injury, fracture, and a sprained wrist. The Support is suitable for light compression. It has a versatile, 360 degree stretch, breathable fabric and contouring design for a more comfortable fit. The product featured is Size Large, please see the Medicare Sports range of Elasticated Wrist and Thumb Supports, which include sizes in Small, Medium and Large.